Elk Hunting 2013: Tell Us About It! Report your elk hunting progress, or "close encounters of the herd kind" in 2013. Give us reports of how it's going so far, or how it went for your season. If you have pictures, please click here, or with no pictures you can add your story as a "comment" below. Keep us updated! 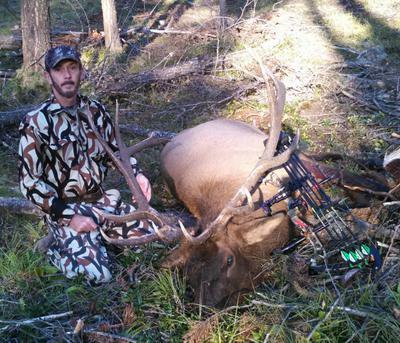 My 2013 successful elk hunt story with a video of the 5 yard arrow kill is on this page. Click on Add Comments below to tell your story, or click here to start a new one with your photos! 2013 Elk Hunt in B.C. Don, from Dallas, TX used a Kimber Montana 325 WSM to kill his bull at 295 yards. You'll find his comments quite enlightening. He also submitted some well organized tips from his seasoned experience on another submission (link below). You will find his tips helpful, even if you are a seasoned hunter. See those "lessons learned" here. Sorry to hear about your mother, Skip. I hope you have better results next year. I booked a First Season Rifle hunt with Dan Humphrey's outfit in Montrose, Colorado. (http://www.huntingtherockies.com/) We did not see hardly any elk for two days. When I got back into camp the night of the second day; I found out that I needed to leave for home as my 94 year old mother had passed away. Dan and Susan run a first class hunting camp. Susan is an excellent cook and all seven of us ate well! As of this writing, I don't know how the guys made out after I left. So I am again saving my money to try again next year. Dan took me under his wing as he knew of my physical limitations. I sure enjoyed his company and learning from his 30 years of elk hunting experience. Lastly I love this website. You can find out anything from guys who enjoy sharing and appear to be great guys. Thanks.